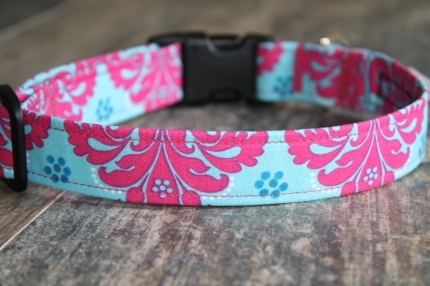 This dog collar features a beautiful turquoise background covered in a pink damask pattern that is fit for a princess:) I have it shown with a black buckle but it can be made with a brown if you prefer! 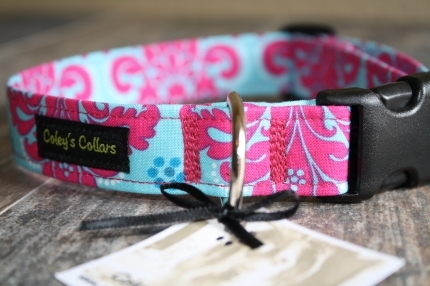 Collars are available in 1/2,5/8,3/4,or 1 in.widths. Measure around your pet's neck where the collars would normally sit and add 2 in. It is easiest to do this using a soft tape measure but if you don't have one you can use a string or a piece of yarn and then measure that. 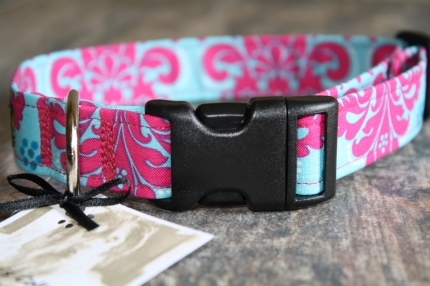 Caring for your new collar is EASY! Machine wash gentle cycle using a mild detergent and then line dry. For extra protection place your collar in a garment bag before washing. Thank you for visiting and don’t hesitate to contact me if you have any requests or questions!